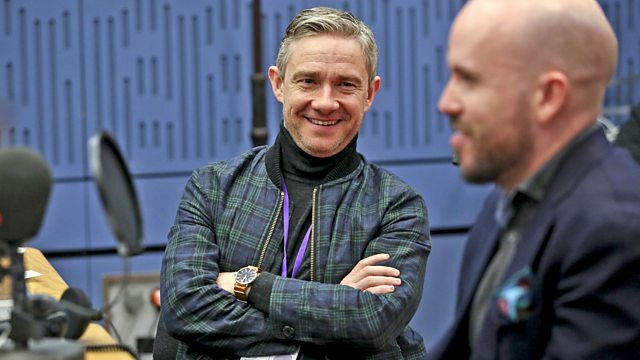 Clive Anderson and Tom Allen are joined by Martin Freeman, Irvine Welsh, Diane Morgan and Sarah Phelps for an eclectic mix of conversation, music and comedy. With music from Lisa Stansfield and The Turbans. 'Dead Men’s Trousers' is published by penguin Random House and available now. 'Ordeal by Innocence' is on Sunday 1st April at 21.00 on BBC One. 'Cunk on Britain' is on Tuesday 3rd April at 22.00 on BBC Two. 'Jazz On The Corner' is available now on Acid Jazz. ‘Deeper’ is available on 6th April on earMUSIC. Lisa's performing at Derngate, Northamptonshire on 6th, G Live, Guildford on 7th and Pavilion Theatre, Bournemouth on 8th April. Check her website for further dates. The Turbans’ self-titled debut album will be released on 6th April on Six Degrees. The Turbans are playing at The Deaf Institute, Manchester on 12th, La Belle Angele, Edinburgh on 13th and Drygate Brewery, Glasgow on 14th April.